A good oral command of English is not only about speaking properly and correctly. It is also about using idioms the right way. In particular, idioms are absolutely essential in talking business when it comes down to understanding others and expressing yourself. If you are lacking a good understanding of English idioms, you will easily get lost in a business conversation. In order to help you find your way through the jungle of business idioms, we have compiled a list of the 50 very commonly used ones, explaining their meaning and giving you an example of how to use them. Ahead of the pack To be more successful than the competition If we want to stay ahead of the pack, we’ll have to increase our marketing budget. Back to square one To start something over again because a previous attempt failed To make this software finally work, we have to go back to square one. Ballpark number/figure A very inexact estimate To give you a ballpark figure, how much the border wall to Mexico is going to cost, I’d say about 30 million dollars. Big picture Everything that is involved with a particular situation Working on all these details, we have lost sight of the big picture. By the book To do things exactly according to the rules or the law We told our auditors that we do everything by the book. Corner the market To dominate a particular market Amazon more or less corners the online retailing market. Cut-throat Very intense, aggressive, and merciless competition Competition in the food retailing business is cut-throat. Easy come, easy go Something gained easily is also lost easily I lost 500 Euros in a poker game last night, but that’s life – easy come, easy go. Game plan A strategy or plan for achieving success What is our game plan for dealing with our new competitor? Get down to business Stop making small talk and start talking about serious business topics Now that everyone’s here, let’s get down to business and start with the presentation. Get something off the ground To start something (e.g. a project or a business) Now that we have finished the planning phase, we’re eager the get the project off the ground. Go down the drain Something is wasted or lost All our efforts in entering this new market went down the drain. Go the extra mile To do more than what people expect To give our customers the best shopping experience, we go the extra mile. Hands are tied Not being free to behave in the way that you would like I’d love to help you, but my hands are tied. In a nutshell Using as few words as possible In a nutshell, we will run out of cash in three months time. In full swing At a stage when the level of activity is at its highest Construction of our new production site is in full swing now. In the driver’s seat To be in charge or in control of a situation Being offered the position of managing director, I’ll soon be in the driver’s seat. Keep one’s eye on the ball To give something one’s full attention and to not lose focus We should not diversify our product offering too much, but rather keep our eyes on the ball. Learn the ropes Learn the basics of something (e.g. a job) I’m learning the ropes in my new position. Long shot Something that has a very low probability of happening Winning the lottery is a long shot. No-brainer Something that is really obvious or easy Making money working for an investment bank is a no-brainer. No strings attached Something is given without involving special demands or limits They will let you try the product for free with no strings attached. Not going to fly Something isn’t expected to work out This product is definitely not going to fly. 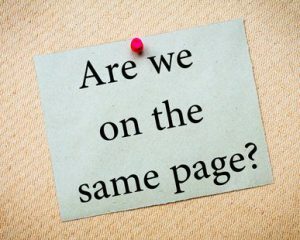 On the same page To be in agreement about something Let’s go over the contract details once more to make sure we’re on the same page. Out in the open Something that is public knowledge and not secret anymore Our financials our out in the open anyway. Put all one’s eggs in one basket To rely on only one thing to bring success It’s not smart to invest in American tech stocks only and put all one’s eggs in one basket. Put the cart before the horse To do or think about things in the wrong order Trying to find an investor without having a business plan is like putting the cart before the horse. Raise the bar To set standards or expectations higher The iPhone raised the bar for smartphone makers. Red tape Official rules and processes that seem excessive and unnecessary The new law is going to create a lot of red tape. Rock the boat To do or say something that will upset people or cause problems Don’t rock the boat until the negotiations are finished. Safe bet Something that is certain to happen It’s a safe bet that computer processor speed will more than triple within the next 10 years. Same boat To be in the same difficult situation as someone else None of us has any money left, so we’re all in the same boat. See eye to eye To agree with somebody My boss doesn’t see eye to eye with me about our marketing campaign. See something through To continue until something is finished I want to see this project through before taking on another one. Sever ties To end a relationship We had to sever ties with several suppliers due to poor product quality. Shoot something down To reject something (e.g. an idea or a proposal) You shouldn’t shoot down your co-workers ideas during a brainstorming session. Smooth sailing A situation where success is achieved without difficulties Once our largest competitor went out of business, it was smooth sailing. Stand one’s ground To not change one’s opinion or position They tried to cut my travel budget, but I stood my ground. Take the bull by the horns To directly confront a difficult situation in a brave and determined way My mid-level managers constantly delayed projects, so I took the bull by the horns and fired several of them. Talk someone into something To convince someone to do something I was reluctant to redesign our website, but my employees talked me into it. Talk someone out of something To convince someone not to do something We wanted to take on more debt, but our CFO talked us out of it. The elephant in the room An obvious problem or controversial issue that no one wants to discuss. We should have discussed our pending litigation, but no one wanted to talk about the elephant in the room. Think outside the box To think of creative, unconventional solutions instead of common ones. Our current approach will get us nowhere. We have to think outside the box. Time’s up Time for something or someone has ended. I think his time’s up as the CEO. Touch base To make contact with someone. I will touch base with you later today. Twist someone’s arm To convince someone to do something that he or she does not want to do. My boss thought the budget was a little high, so I had to twist his arm to get him to agree to it. Up in the air Something is undecided or uncertain Our international expansion plan is still up in the air. Uphill battle Something that is difficult to achieve because of obstacles and difficulties Gaining market share in this country will be an uphill battle due to tough competition. Upper hand To have more power than anyone else and so have control Due to my experience, I had the upper had in the argument. Word of mouth Something is given or done by people talking about something or telling people about something Many local stores rely on word of mouth to get new customers. This entry was posted in Miscellaneous and tagged business idioms, idiom, idioms. Bookmark the permalink.